Q1 (fast antioxidants) : Refers to the antioxidant capacity of the compounds with the highest rate of free radical scavenging. Q2 (slow antioxidant): Refers to the antioxidant capacity of the compounds with a lower rate of free radical scavenging. What is e-BQC lab based on? e-BQC lab is a small device that works with low cost e-BQC fungible strips. It is based in electrochemistry, the science that revolves around reduction and oxidation of molecules. 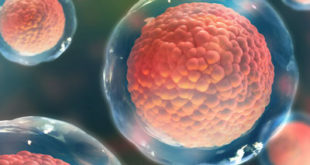 With only a drop of sample and in less than a minute, a quick and reliable measurement of the sample’s antioxidant capacity, allowing to differentiate between Q1 and Q2. This differentiation (Q1 and Q2) is very valuable, since, in traditional methods, we only obtain a value (regardless of the type of antioxidant that we find ourselves against), so it is not a real antioxidant capacity. It allows to differentiate the type of antioxidants that the sample possesses, allowing us to weigh the measurements and obtain a more complete assessment of the total antioxidant capacity. 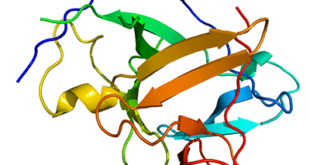 The higher the value of the intensity, the more molecules are oxidized to that potential, and therefore the sample has a greater antioxidant capacity. This results in a greater resistance to oxidation. 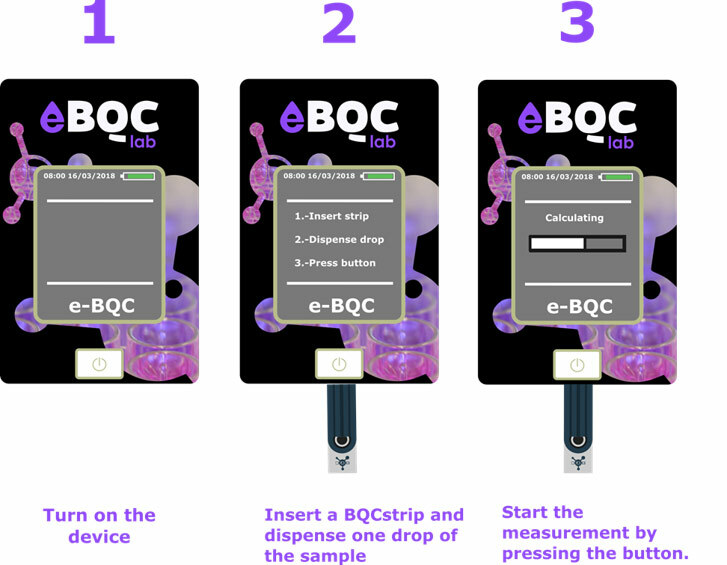 How does e-BQC lab work? e-BQC lab is based in electrochemistry, the science that revolves around reduction and oxidation of molecules. It is a small device that works with low cost fungible e-BQCstrips. Why should I use e-BQC lab? Portable device to make a quick and easy measure anywhere. The result is obtained in less than a minute what saves a lot of time. In less than a minute, with only a drop, your results will be available. 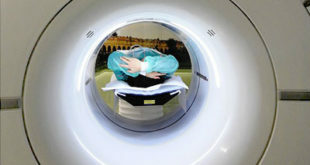 You will only need one device for all your antioxidant capacity measurements. 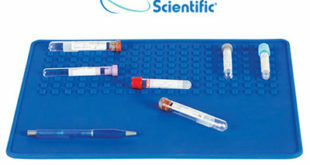 Any liquid sample: biological samples, drinks and beverages. 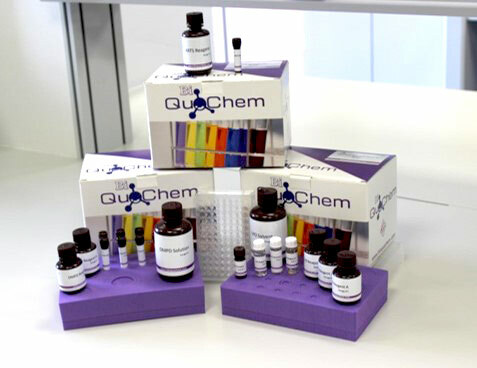 Bioquochem is a biotech company that designs, develops and manufactures kits and devices for rapid and easy quantification of biological parameters or biomarkers. Our kits are more sensitive, accurate, reproducible and faster than conventional ones, because they have been specifically designed to improve all these characteristics with respect to the products from the competition. The company is specially commited to offer the best service to our clients, having particular regard to technical assistance before and after acquisition of our products. BQCkit brand includes a wide range of kits, that is continuously growing due to the active work of our R&D department. Something remarkable is that our products are reasonably priced, but always maintaining the highest quality standards. Finally, as the company is aware of the value of time, we count on the best worldwide delivery service. 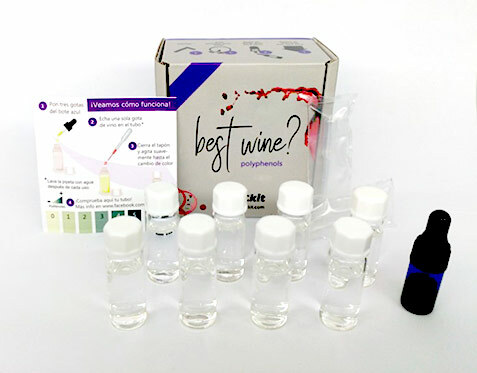 Bioquochem also designs and develops devices for the quantification of the antioxidant capacity in different matrices such as blood, for the evaluation of oxidative stress, or drinks, for the analysis of the antioxidant capacity in wine. BQCkit brand, designs and manufactures kits for rapid and easy quantification of biological parameters. BQCkit also has a Home Test Line. 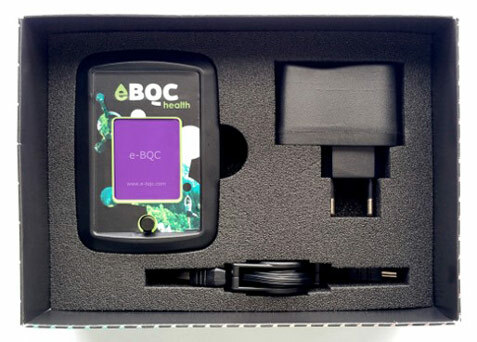 eBQC New Technology, the first device able to difference between two types of antioxidants, fast and slow. This portable device measures antioxidant capacity in less than a minute.